To all the women who attended my Homecoming retreats in 2008, 2010 and 2012…thank you. You will always hold a special place in my heart and the memories of those October days we spent together are still resonating in my soul. The bonds forged among women – and with yourselves – at those retreats are fierce, catalytic, and enduring. For this reason, I have elected to leave this retreat page up even though I will no longer be offering Homecoming – so you can visit often, watch the videos, see the pictures, and touch the experience again. You might want to start here..
To all the women who are interested in attending one of my future retreats, please continue to follow me on my Facebook page or sign up for my newsletter to stay in touch. It was a hard decision to not to offer Homecoming again in 2014, but it was time, and I am consciously making room for another retreat to be born. I don’t know how it will look yet. But in the meantime, feel free to look around at this one…I guarantee whatever I do decide, it won’t stray too far from the spirit of this one. Come home to yourself for a three-day retreat on a beautiful lake in Southern Maine. Encircle yourself with like-minded women or just be by yourself. Chose from a diverse selection of workshops and gatherings or simply create your own experience. Get away from the Shoulds. Connect with the magic of nature and the feminine spirit. This is a getaway for you, a group of friends, sisters, mothers and daughters, and some new faces. Space, structure and options—large and small—will be abundant for the choosing throughout the weekend. Let your inner compass guide you. Pack a sweater and a healthy dose of intention. It’s your time. Take a moment to stroll through all the retreat pages – there are lots of details, descriptions, photos and testimonials to orient you to what this retreat is all about. And don’t be surprised if this is the first time you’ve ever considered going to a retreat like this…you won’t be alone. 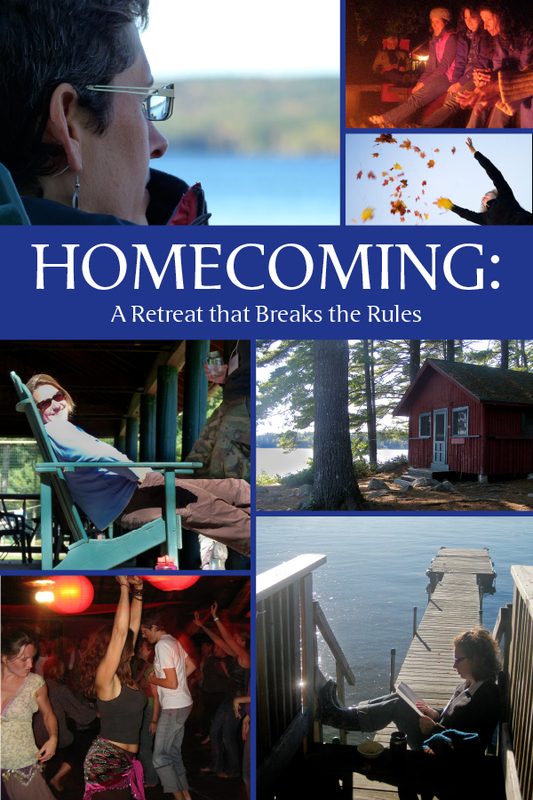 Homecoming has that effect on women – it invites you to break a few rules.